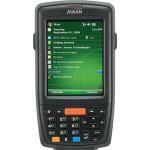 Designed to deliver maximum return on investment, Janam’s XM Series mobile computers are feature-rich and affordable. These rugged Microsoft Windows handheldsdeliver advanced barcode scanning, robust WLAN communication and long battery life. With the latest, most powerful Freescale processor and double data rate (DDR) memory, the XM66 brings impressive horsepower to the point of activity. Features designed for the front line and a price that drives the bottom line set Janam’s XM Series ahead of its class. Janam’s XM Series mobile computers are sculpted to fit in the hand and are the only products in the category that weigh less than 280 grams and have a full 3.5” display. The units are capable of withstanding repeated 1.2 metre drops to concrete and are sealed to IP54 standards. The XM66 has a user-accessible microSD card slot and full suite of accessories and cradles that accommodates varying enterprise application needs.